Learn how to transform your lifestyle from toxic and self-destructive to healthful and self-affirming, and experience renewed energy and vitality that will last a lifetime. 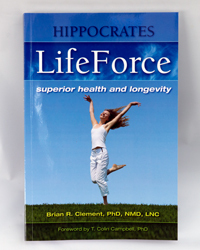 Hippocrates Institute director Brian Clement shows how the Hippocrates LifeForce program implements the use of raw living foods to help people maintain a healthful weight and stimulate natural immune defenses against cancer, heart disease, and other chronic illnesses. Readers also discover how to develop the positive frame of mind that supports good health, learn how to make the transition to eating raw living foods at home, while dining out, and when traveling, and learn how to create the support system they need to stay on track. Also included is detailed information on therapeutic juicing and sprouting; the role of vitamins, minerals, and phytochemicals and the use of medicinal herbs, as well as recipe favorites from the Hippocrates kitchen.